Large and fearsome looking carpenter bees are normally docile and rarely sting people. They can sometimes be destructive if they begin nesting in humans' wooden structures. In the Sonoran Desert urban habitats they nest often in dead branches of oleander and various trees, especially chinaberry. Old agave flowering stems are a favorite nesting place in natural settings, but meticulous gardeners throw these into the trash to the detriment of their own wooden abodes. Carpenter bees do not form colonies ... each mother bee builds her own nest as a tunnel into decayed/soft wood. She divides the tunnel into cells and provides each cell with a provision of nectar and pollen. An egg inside each cell hatches into a grub that eventually matures, pupates and emerges as a new bee. These bees are important native pollinators and are vital to ecosystem health. Image taken in Phoenix, Maricopa Co., Arizona. March 11, 2007. This early-emerging female is struggling to find sufficient nectar. 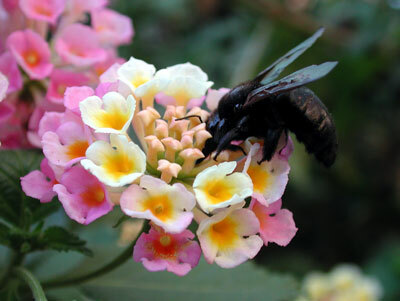 In this case she is chewing into the bases of unopened Lantana flowers to get to nectar thereby bypassing pollination. Her head and mouthparts cannot enter these flowers through the too-narrow tube. Copyright Michael J. Plagens, page created 16 March 2007.